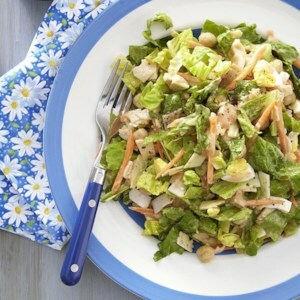 Find healthy, delicious chopped salad recipes, from the food and nutrition experts at EatingWell. 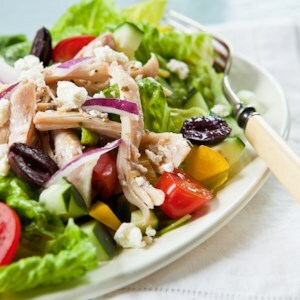 In this tandoori chicken salad recipe we grill chicken and toss it in a salad with grilled tomatoes and cucumber. 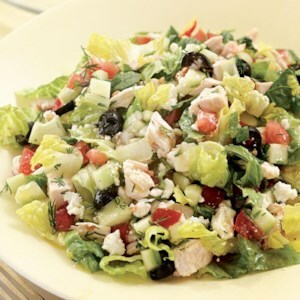 Enjoy a taste of the Mediterranean diet with this chopped Greek salad with chicken. 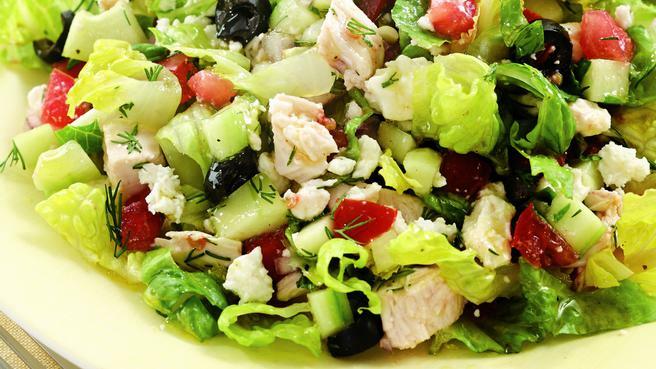 Serve this salad with hummus and pita bread for a healthy dinner. 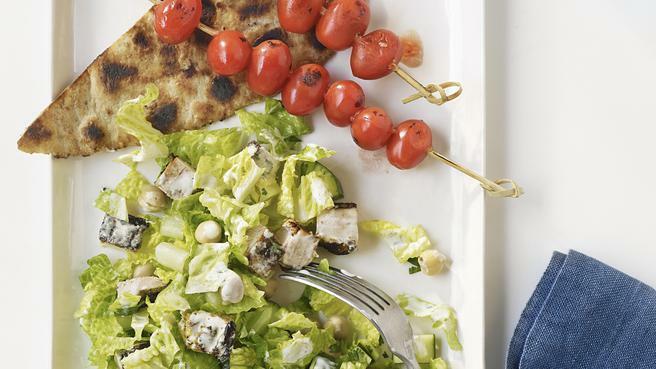 Baked tofu adds meatiness and protein this healthy packable lunch salad. 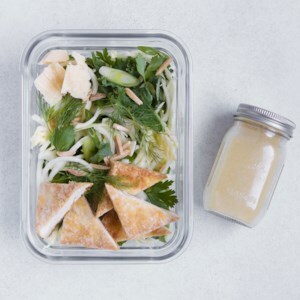 A topping of toasted almonds and Parmesan adds a layer of nuttiness, and honey-mustard vinaigrette gives everything a sweet-tangy finish. 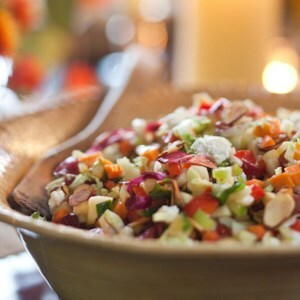 Knock it out of the park at dinner with this composed salad recipe inspired by the crazy-popular Stetson Chopped Salad at Cowboy Ciao in Scottsdale, Arizona. 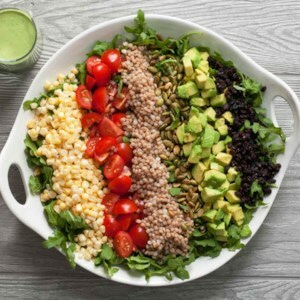 It packs in colorful vegetables and a variety of textures from whole grains, seeds and a creamy homemade dressing for a photo-worthy, healthy meal. 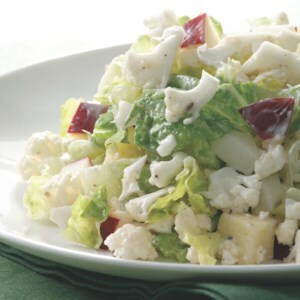 Keep it vegetarian or add smoked salmon or roasted chicken. 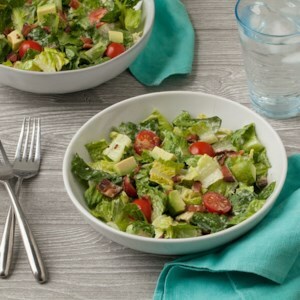 Turn a classic sandwich into a healthy salad with this easy BLT-inspired recipe. 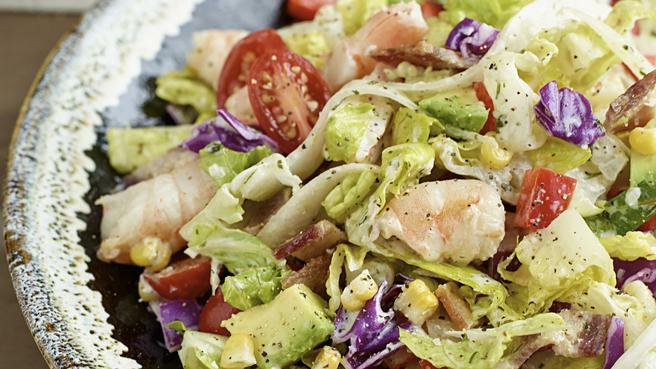 Didn't think a BLT could get any better? 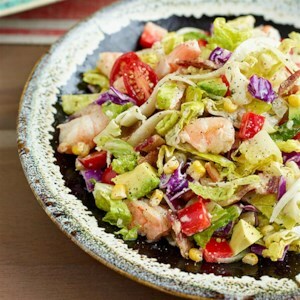 Add creamy avocado to punch up the flavor and texture. 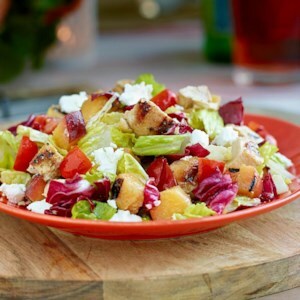 For a more elegant presentation, arrange the ingredients for this main-course chicken and nectarine salad recipe separately on a large serving platter instead of combining them in a large bowl. 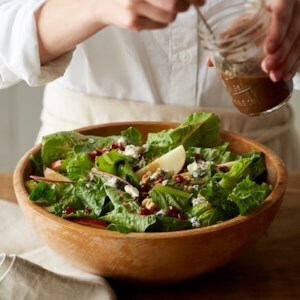 Drizzle with the honey-dijon dressing just before serving. 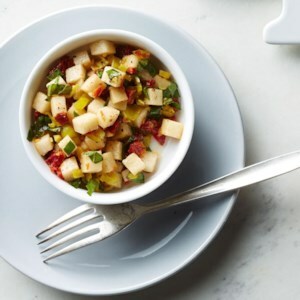 Caraway and cauliflower are a match that brings to mind wursts, kraut and foamy, cold mugs of beer. 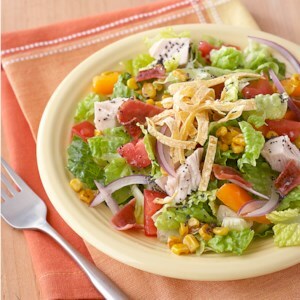 Alas, not everyone loves that caraway flavor so leave out the caraway seeds if you prefer--the salad's wonderful either way. 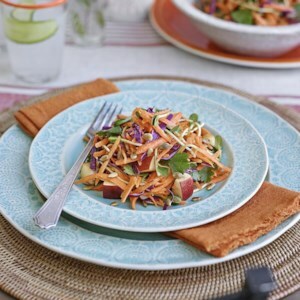 The slightly sweet, nutty flavor of jicama--a round root vegetable with thin brown skin and white crunchy flesh--is delicious in this quick, Italian-style slaw recipe. Peel the jicama with a knife or vegetable peeler, making sure to remove both the papery skin and the layer of fibrous flesh just underneath. 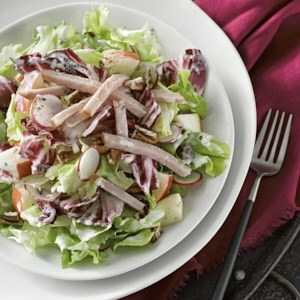 This healthy main-course chopped salad recipe pairs bitter escarole and radicchio with sweet apple, smoky ham and crunchy pecans. 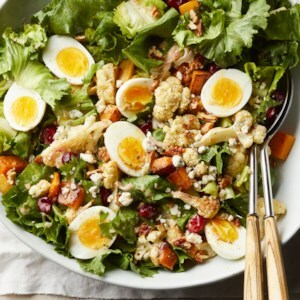 But the pairing possibilities are limitless--you can also use cooked chicken and tangerines instead of ham and apples or bell pepper in place of the radishes. 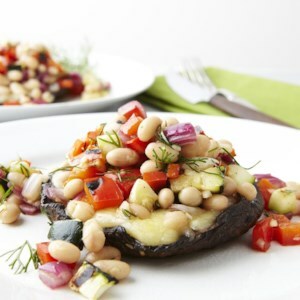 Serve with pumpernickel bread toasted with extra-sharp Cheddar cheese. 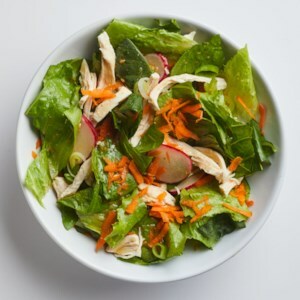 We gave a classic chef's salad recipe a healthy makeover with our own homemade healthy Thousand Island dressing recipe and reduced-sodium cheese and turkey. 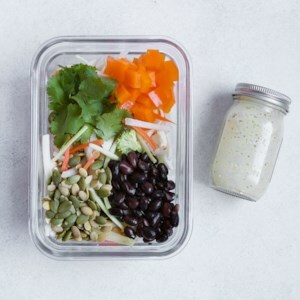 Those swaps slashed 260 calories and nearly a day's worth of sodium (2,131 mg!) 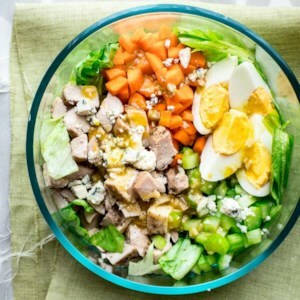 per serving compared with traditional recipes.